Disney Fans and Foodies, listen up: Mickey has a new cookbook! 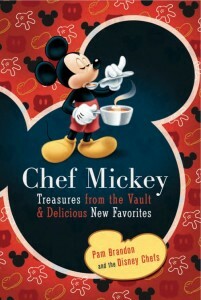 Chef Mickey: Treasures from the Vault & Delicious New Favorites focuses on great vintage recipes that fans of Walt Disney World, Disneyland, and Disney Cruise Line would have a hard time finding elsewhere. But that’s only half the story, because Pam Brandon and the Disney Chefs are also bringing you brand new recipes to serve and savor, as well as some great old pictures that will transport you back to vacations gone by. So, if you think you deserve just one more Christmas present – or you’d like to get a few items crossed off next year’s list – check out the new book. Chef Mickey: Treasures is available on Amazon.com, or you can order it by calling 407-363-6200, or by emailing wdw.mail.order@disneyworld.com.